Close to amenities, shopping, and restaurants in nearby Richmond, Burlington, Stowe, Williston, Essex, and Waterbury. 2 bedrooms. Sleeps 4. Sheets, towels, and bathroom toiletries included. Full bath. Kitchen with coffee, coffee maker, toaster, microwave, full refrigerator, & stove with cook top. Dining area with table and chairs. Laundry room including full sized washer and dryer, hangers & iron. Large flat screen t.v. DVD player. Phone, wifi, and internet. In the late 1960s we sold our sailboat to buy 25 acres of land on a brook in Richmond VT. In the early 1970s, we built a one room log cabin. Running water was a hose going from the brook to the cabin. We cooked on a cook top, kept our food in a cooler with ice we bought from the local store, and heated by wood stove. Our only amenities were electricity and a chemical toilet! As our family grew, our desire to become more comfortable grew, and so grew the cabin. Today it is a two bedroom home with a full bath, full kitchen, a washer and a dryer, heat and hot water! We get there whenever we can, and are happy to share our little slice of heaven in VT with travelers. 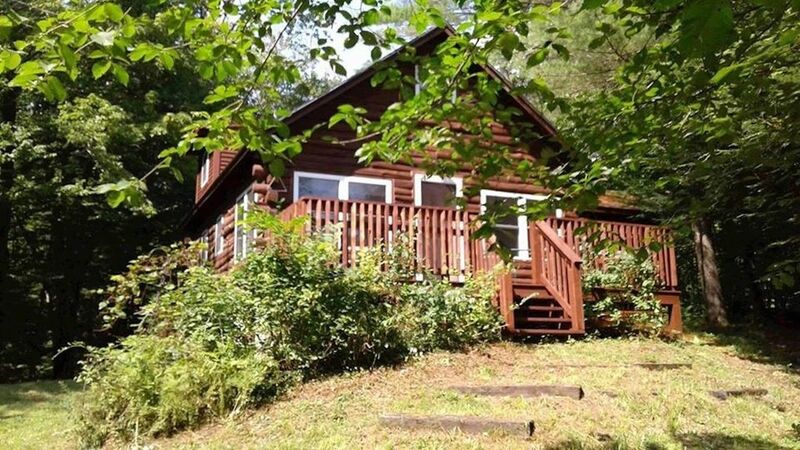 Informal, cozy, and comfortable cabin tucked down a quiet road is perfect for relaxing, but close to nearby recreational activities, towns and Burlington, for entertainment, shopping, and dining out. There is a $95 cleaning fee. The cabin will be clean when guests arrive and we ask that it is left tidy, but the housekeeper will come to do the linens and clean after guests leave. Check in is at 3 p.m. and check out is at 11 a.m., but we can make other arrangements, if necessary. Just returned from our 2nd stay. Great location and accommodations. Thanks Laura! Beautiful setting in the Vermont woods with a creek running near the cabin. We mostly enjoyed our stay. The cabin was clean. The appliances worked. The bedding was worn with an odor. The cabin could use more lighting. We have determined that the new bedding that was on the bed might have smelled a bit musty as the room had not been occupied for almost a week, and the cabin had been closed up, therefore not allowing fresh air in the room. Rest assured that the linens were recently purchased and are always laundered and changed after each guest! As to the lighting, we have recently purchased additional lighting. A Perfect Getaway From City Life! My wife, our two children, and I recently rented the Cabin in the Woods for a long weekend. It was absolutely wonderful. Waking up to the sound of the babbling brook right outside the window was the perfect antidote to our day-to-day life back in Boston. The cabin was very clean and comfortable, and the front deck was a perfect place for morning coffee. It is also a very quick, 15 minute drive into downtown Burlington and beautiful Lake Champlain - we had a fantastic weekend. My friends and I had a great time when we stayed at the log cabin. Everything was super clean and the guest book was very descriptive, providing great places to eat and activities during the day. I would highly recommend this VT experience. Wonderful cabin in a special spot. I just spent 2 weeks over the holidays.. it was wonderful. Very homey and comfortable. Beautiful place to wake up and look through the windows at the scenery while eating breakfast. Laura is a fabulous host. She has thought of everything to make it perfect. Can’t wait for my next visit!